High school students get a chance for some real, hands-on work at the ADSS Christmas tree farm. ADSS students work at the school's Christmas tree farm on Airport Road. It’s been a busy season for the Alberni District Secondary Christmas tree farm. “It’s been really good—good Christmas tree season, good educational season with the kids, they’re learning all sorts of stuff,” said ADSS project based learning forestry teacher Ryan Dvorak. 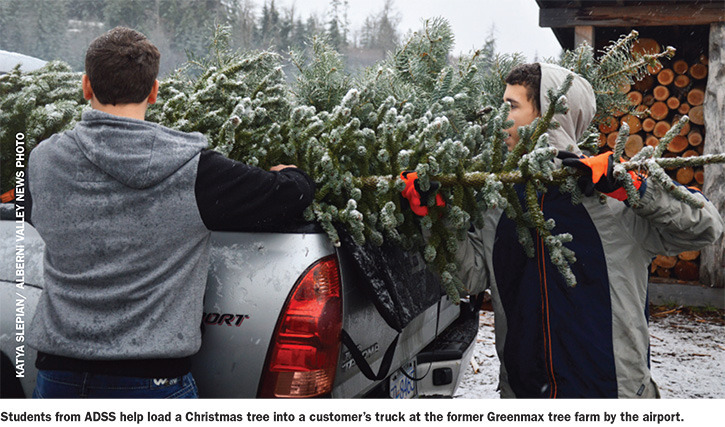 This is the third year the ADSS kids have sold Christmas trees at the farm, which was originally built by Shawn Flynn and Dave McBride—who made up Greenmax—in 1997. “We cleared the land, planted the trees and started the farm,” said Flynn. Last year, Flynn sold the farm and now helps the school with the project based learning class. “This is our Project Based Learning program and our forestry program so this is a good opportunity to get the students out and show them what actual work is and what business is,” said Dvorak. “The fact that the school district owns it provides an extra level of impetus in terms of understanding how to go from a seedling to this,” he added, gesturing around the eight-hectare farm. It also provides a different way to learn. Students in Grades 9–10 are involved in the project based learning program. The students are out on the farm for two days a week per program. “We’ve got a Grade 9 program, which is an academic-based program for outdoor learning. That program has 24 students that look at math, English, science and social studies,” said Dvorak. The Grade 10s take that one step further. “It’s looking at connecting students with an idea of where they might want their future to go in terms of trades or post-secondary opportunities around schooling,” said Dvorak. The end result is to leave the students with an education that looks at both theory and practice. With a mix of practical experience, the program gives kids interested in all sorts of different career fields ideas for their futures. Jimmy Hassle has already gotten a head start on a career in natural resources. “I do heli-logging and shake blocking on the weekends and firewood in between,” said the Grade 10 student. This is just another opportunity for Hassle to get out of the classroom and apply the skills he’s learning. “You value the skills a lot more than being at a desk all day,” he said. But even students who aren’t looking at a career in forestry are inspired by the program. Elyse Warm joined for the opportunity to explore a subject she otherwise wouldn’t have—and to pick up some tips. The Christmas tree farm acts a source of revenue for the school as well. All of the proceeds go back to ADSS and last year, the girls’ rugby team toured Ireland as a result.